The user manual template is an MS Word template, that contains all mandatory elements to create your own user guide. 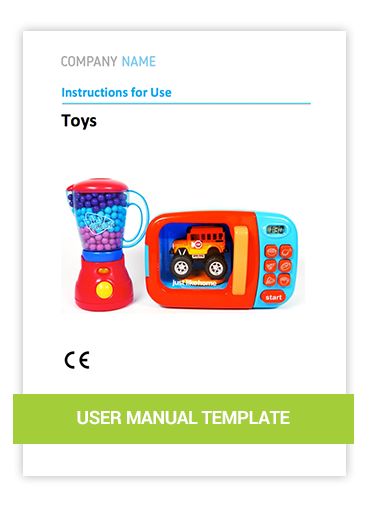 You can use the template to create a manual that complies with the CE marking requirements, the Toy Directive, the EN 82079 standard for User Instructions and the ANSI Z535.6 for Safety Messages. Essential instruction manual template for all manufacturers, importers and distributors that trade toys within the European Union to pass customs with no delays, be able to sell your toys within the EU and decrease liability. You want to import, trade and/or sell your toys on the European market? You want to do this according to the legal requirements to avoid problems at customs or to decrease liability? We have developed a user manual template to make it happen. A lot quicker and easier than you ever imagined. A user instruction’s function is to explain to the user how a product can be used safely and correctly. The user manual informs the user about risks that still persist, despite the adoption of measures for inherent safe design, safeguarding and complementary protection. Failure to warn the user properly can make the manufacturer liable in case of any accidents. That’s why the duty to warn/provide instructions with the products is regulated and often mandatory. The User Manual Template is a MS Word file that contains all mandatory elements, as required by CE marking and other relevant European product safety directives, to create your own compliant machine operation manual for the EU market. The Toy Safety Directive gives requirements on the content of the user instructions, called the Essential Requirements. The User Manual Template contains all these mandatory elements that are placed in the right position, so you know exactly what to add and where to add it in order to create a compliant manual. Besides CE marking directives, other directives might apply to your product, such as the WEEE, REACH, packaging or battery directive. These directives also give requirements on the information that needs to be provided with the product, mostly related to safe disposal. The User Manual Template contains ready-to-use texts to comply with these requirements. The EN IEC 82079-1:2012 Preparation of instructions for use is an international standard that provides both general principles and detailed requirements for the design and formulation of all types of user instructions. The standard has been harmonised by the EU, which means that by applying the standard you create the highest level of presumption of conformity with the Essential Requirements of the Directives. The User Manual Template contains all elements as provided by the 82079 that can be easily adjusted to your own needs. The table of contents of the User Manual Template is based on the content requirements as given by this internationally recognised standard. All our templates have a 14-day, no-reason-required guarantee. So if you are not satisfied for any reason, just let us know and we’ll refund your money. As we believe that our product really helps you to create better instructions, we don’t think it’ll come to that. But as soon as you have any doubts whether our product is the right fit for you, just put your mind at ease. We will help you to get the results you want, or we will give you your money back!